Emirates Gold DMCC was founded in 1992 by Mohamad Shakarchi and has its headquarters in Dubai; a city where historically East meets West and traditionally known for its high purity gold jewellery and gold trade. From humble beginnings, the company now has expanded to become one of the top 65 companies of the world, smelting over 200 tons of gold per year as well as silver. Members of the DMCC and an LBMA associate supplier, the company ethos is to put its customer first. 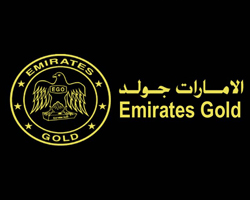 With investment in high-tech development, state of the art equipment and its support for the "Responsible Gold" policy, Emirates Gold DMCC is set to continue growing and continue providing a wide range of premium investment bullion bars. We stock a large selection of Emirates Gold and Silver Bullion Bars.